Psilocybin, a naturally occurring psychedelic compound found in more than 200 species of mushrooms, has been illegal in the United States for more than four decades. The experience of "tripping" on this psychedelic, known under the street name of "magic mushrooms," has been called a life-changing experience. Of course, given its criminalized status, these claims have often been dismissed. But science is showing there may be a whole lot more value inherent in this drug besides getting a recreational high. Several studies in various phases are proving that psilocybin may serve a very important purpose in the treatment of mental health. This all comes in a day and age where perceptions about drugs and their potential power for good are shifting. Drugs that have long been criminalized and classified solely in terms of their abuse may actually have a role in the world of mental health treatment when utilized in a controlled way and under the guidance of professionals. There has been increased open-mindedness about uses for psychedelics as a helpful treatment tool, with studies to back it up. One of the most recent studies, the New York University (NYU) Psilocybin Cancer Anxiety Study, aimed to specifically look at how psilocybin might be clinically used to ease cancer-related anxiety both in patients who currently had cancer as well as those who no longer had cancer but feared its recurrence. A concurrent study out of Johns Hopkins University explored the same theory. Both studies were published last December in the Journal of Psychopharmacology with promising results. Approximately 80% of cancer patients showed clinically significant reductions in anxiety and depression. What's even more staggering is the fact that these reductions didn't just go away after the hallucinogenic experience had ended; the change stuck with the patient. "Anxiety and depression improved significantly—and this lasted for up to eight months," explains Jeffrey Guss, MD, coprincipal investigator on the NYU study. "It's not that those feelings started to come back after eight months; that's simply when we stopped measuring the effects for the purpose of the study." Of course, not everyone had such a robust response. But Guss says that overall the results were impressive and showed great promise for future use of psilocybin in the oncology community. Many patients walked away not fearing death—or their cancer—to the extent they had previously. For some patients, that fear was taking over their lives. Lisa Sevanick, MSW, LCSW, an oncology social worker with the NYU Cancer Center who was a cotherapist in the study and sat in on the psilocybin sessions, says she was eager to be part of research that would explore ways to reduce anxiety and depression in cancer patients. As an oncology social worker, Sevanick says she has witnessed the fear associated with cancer—either facing it or fearing its relapse—to be crippling. And despite therapy and support sessions, patients can't always open up and address the fear in a way that helps them overcome it. But during the psilocybin sessions, Sevanick says there was a remarkable difference in how the therapy session went. One key point of the use of psilocybin is that it was part of a "drug-assisted therapy" session in which the patient worked through issues under the guidance of therapy. The session took place in a quiet room that served as a controlled setting and patient's vitals were constantly monitored. Guss says this is all quite important as this was not the "study of a drug," but rather "the study of a drug-assisted therapy." He says that the psilocybin and the therapy are connected and separating them is meaningless, as it is the use of the two together that makes this such a powerful treatment tool. "I don't think that psilocybin will ever be a medicine prescribed by doctors to be taken alone at home—nor do I think it should be," Guss says. "The medication itself is quite safe—there are some slight side effects like raised blood pressure—but it does impair your judgement and your ability to make good decisions while under its immediate effects (for four to six hours). That's why we believe it needs to be given in a safe and monitored setting." The presence of a therapist is also critical not only for safety but also for the most success in working on issues of mental health. Guss and Sevanick say that throughout the session they are guiding the patient to explore issues at hand. They talk to the patient in depth about his or her specific fears, what is needed in order to push through those fears, and how the patient's life may be changing. It is these conversations that really have an effect on patients working through their anxiety and depression. It also seems the outcomes associated with a "bad trip" (as it's been called) such as nausea, paranoia, or panic, can be minimized in this controlled setting, and managed therapeutically if they occur. As a patient starts to work through some deep-seated issues relating to their depression and anxiety, the experience can become intense or frightening. In the presence of a party or a public event where there are also loud noises and visuals to deal with, that experience can become disorienting or upsetting. But in the presence of a therapy session—occurring in a quiet room with someone holding your hand and walking you through it—the careful containment can be more effective at managing frightening emotions and therefore be considerably less frightening. Sevanick describes one of the study patients she was working with who was experiencing quite a bit of distress during the session. She says it was as though she wasn't getting to the place she wanted to be. She seemed discontent and uncomfortable. But Sevanick says that much of that response may have been out of an internal struggle to delve into difficult issues. "Sometimes what really encourages them to work through a tough issue is to push through that fear—and that's hard," Sevanick says. "Sometimes what seemed the most frightening during their experience also ended up being the most important in their process. Often that fear and distress lead them to come to terms with their struggles." Guss says that unsurprisingly, it might be intensely frightening coming to terms with death, as these sessions may help a patient do. Patients who have been struggling with the fact that their life is coming to an end may have never been able to face it in a way that they could during a psilocybin-assisted session—and that is often profoundly sad and scary. But oftentimes it was those moments of intensity and fright and sadness that turned into something beautiful as they worked through it, Sevanick adds. It was often those intense moments that ultimately gave them some peace. In addition to utilizing psilocybin for cancer-related anxiety and depression, Guss says that there are many other viable applications for which this drug could be explored. He says that psilocybin-assisted therapy could potentially be an effective treatment for PTSD, anxiety and depression (in noncancer patients), and even alcoholism and addiction. The latter might seem conflicting since psilocybin itself is a drug but Guss says that psilocybin has not been shown to be addictive. In the same way that therapy with the assistance of psilocybin can help cancer patients work through their fear, the drug may also help those ruled by addictive substances to work through their addiction. "To quit drinking, a patient needs to be able to say, 'I need to quit' and 'I can quit,'" Guss says. "It is often difficult to truly believe the latter. But with psilocybin we see that sense of confidence increase and they need that confidence in order to really follow through on what they're saying. With psilocybin-assisted therapy our hope would be that patients would see an enhanced sense of truth of those statements—'I need to' and 'I can'—and would actually follow through." While the possibilities are exciting, there is also red tape to still get through. Guss says that with their Phase II study complete, the next step is moving into Phase III, which—if all goes as planned—would end with a petition to the FDA to consider rescheduling psilocybin for medical use. But the earliest the time line would allow for that would be 2025—and there is always the possibility it could be held up further. Still, it's something that is on the horizon, and therapists like Sevanick and Guss remain hopeful. Should psychedelic medicines become part of future treatment, there would absolutely be a role for social workers to assist in therapy sessions. "Having witnessed cancer patients who are truly suffering, the opportunity to be able to help in a profound way is really meaningful to me," Sevanick says. "I think that as social workers, any therapy that can impact human suffering is going to raise our attention. 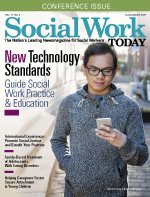 This is something that I would think most social workers would be on board with—knowing that it can make a difference and can be done in a safe way."